The Canadian Council on Animal Care is the national peer-review organization responsible for setting, maintaining, and overseeing the implementation of high standards for animal ethics and care in science throughout Canada. Yesterday it released the 2016 statistics describing the numbers and species of animals utilized in science. It shows that 4,308,921 animals were used in research in 2016. The report also included statistics regarding the purpose and severity of the research procedures. CCAC certified institutions utilized 4,308,921 animals in 2016, representing a 20.7% increase over 2015. 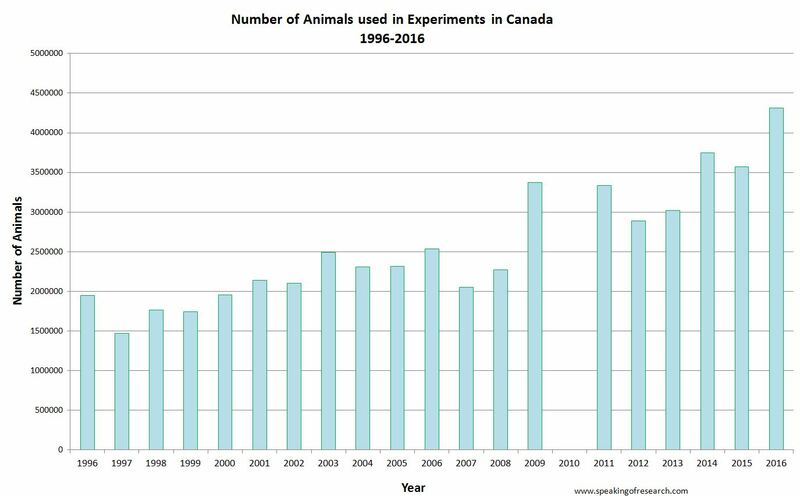 While the vast majority of Canadian institutions report animal use numbers to the CCAC, it is unclear if the general trend of increasing animal use number is reflective of an actual increase in the number of animals participating in studies or rather that more institutions are participating in the CCAC certification process. Further information on the CCAC can be found here. Fish were the most utilized species representing 1,602,547 (37.2%) of all animals. This was consistent with the 2014 data but a change for the 2015 statistics that saw mice as the primary species. Mice still saw a 7% increase to 1,500,156 (34.8%) animals. While different from many other countries cattle maintain their position as the third most reported species with 526,249 (12.2%). Fish, mice and cattle together represent 84.2%, with rats and birds making up a further 10.2%. 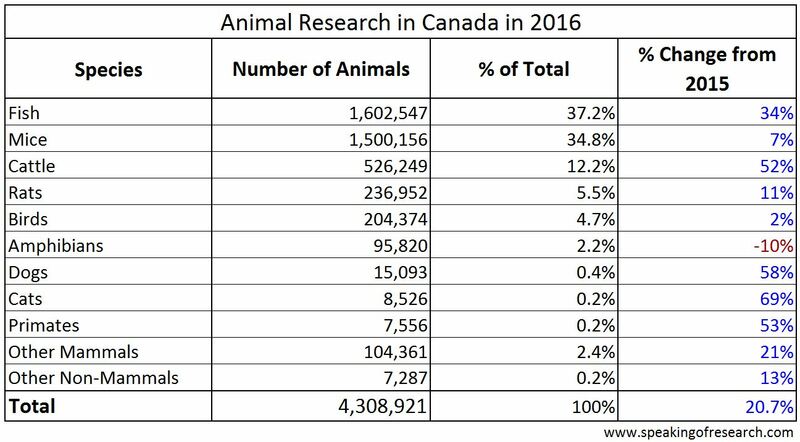 Dogs (15,093), cats (8,526) and primates (7,556) together continue to represent less than 0.8% of all animals used in science in Canada. It is worthwhile noting that these numbers also include 30 cephalopod invertebrates but do not include other invertebrate animals that are also extensively used in research, such as the fruit fly Drosophila Melanogaster and nematode worms. 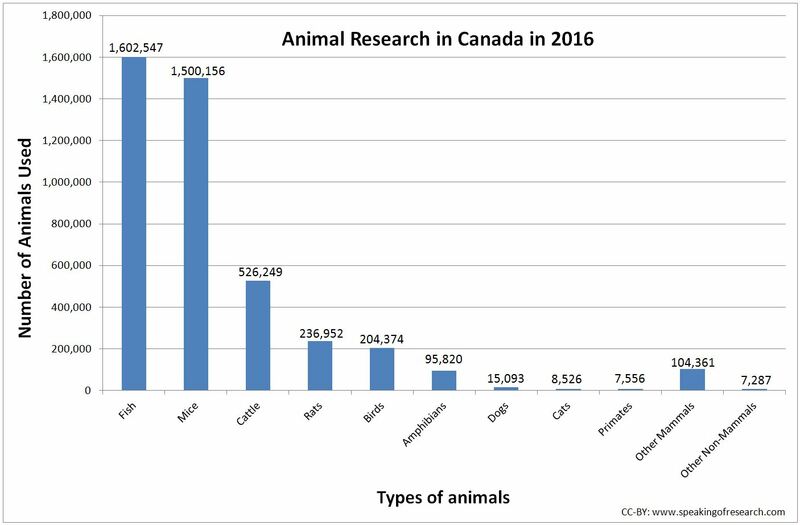 The trend over time in animals used in research in Canada. Click to Enlarge. Animal studies have been increasing steadily among CCAC members over the past twenty years – more than doubling over the time period. This may reflect similar increases in biomedical research funding by the Canadian Institutes of Health Research (CIHR is not the only organization funding biomedical research in Canada). 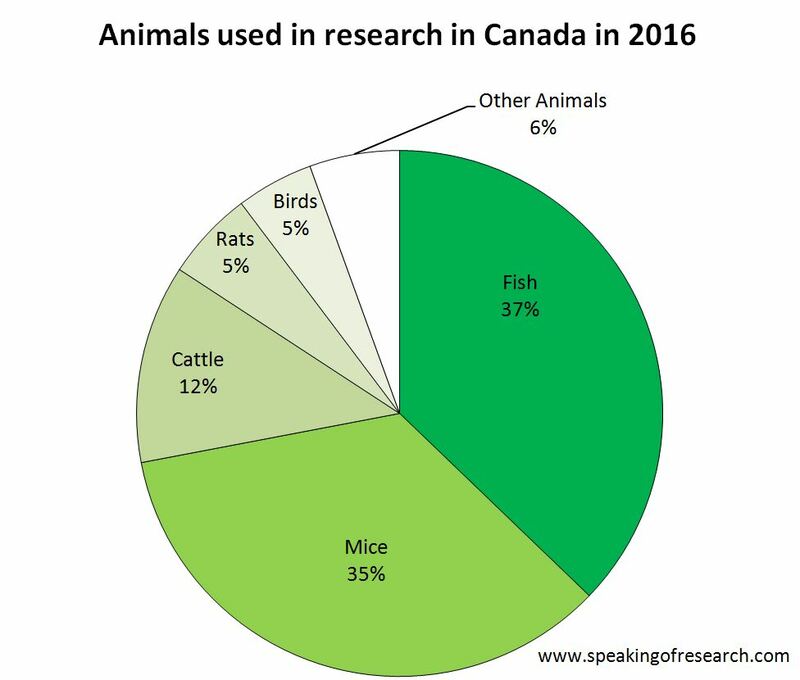 Severity of animal research in the Canada in 2016. Total number of procedures is higher than number of animals due to reused animals being counted more than once. In comparison to the 2015 statistics, there was an overall total percentage increase of 7.4% to 38.5% of animals in the lowest severity category. This category would include the breeding or animals that were anesthetized and did not wake from procedures. Animals experiencing mild severity (ie. a blood sample or injection) saw a drop of 6.6% to 30.8%. While animals representing moderate (ie. surgery with appropriate pain control) and severe (ie. pain-related research) remained relatively consistent at 28.5% and 2.2% respectively. The purpose of animal experiments was for basic research (57.2%); development of products or appliances for human or veterinary medicine (14.1%); studies into human and animal diseases or disorders (12.9%); education and training (9.7%); and finally regulatory tests (“animal testing”) (6.1%). Posted on September 27, 2017 October 2, 2017 by EditorPosted in News, StatisticsTagged animal numbers, Canada, canada statistics, cattle, Statistics. Next Next post: Research Roundup: Drawing closer to curing the organ transplant shortage, using dengue antibodies to minimize the effects of Zika virus and more!